But some of them choose alternate accessories. When he’s not wearing the pride and glory of setting the world record for most donairs destroyed in an hour’s time, Joel Hansen is wearing a lot of different hats. According to this guy’s Instagram bio, he’s a model, an actor, and has an Msc (c) in Applied Human Nutrition. And he has another account that’s totally dedicated to his over-the-top feasting endeavours. 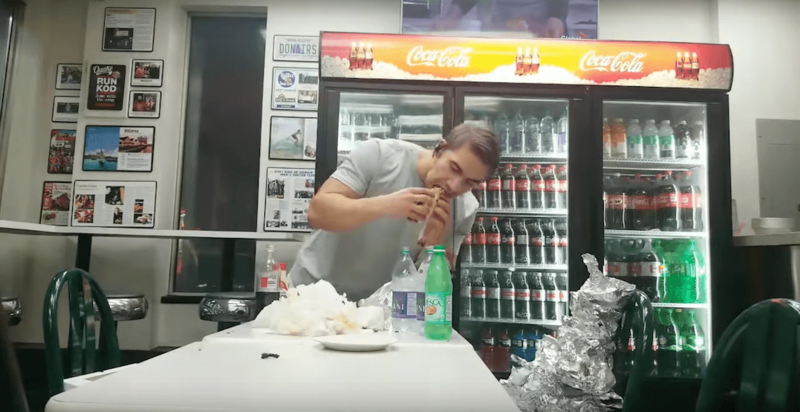 In a video posted to YouTube, Hansen devours 19 donairs over the course of an hour. According to the vid’s title, that’s a world record. He starts off chipper, ready to dive in. But as the video goes on, the heaviness of those glutenous, meaty bites seem to begin weighing on his body. Around 1:05:35, Total Eclipse of the Heart starts playing in the background. If that isn’t poetic, we’re not sure what is. You did it, Joel. You set a world record! Good for you.